The upcoming Formula 1 (F1) season is destined to be another challenging and intriguing one indeed. Red Bull, Mclaren and Ferrari remain serious contenders for the Championship. Mercedes is considered by some to be a dark horse in this year’s campaign. Mercedes had undergone a major transition at the end of last year when Michael Schumacher (the Greatest Driver of all time) bowed out of the F1, after a rather uneventful comeback with the German Team. His retirement has left a huge vacuum in the team as well as Formula 1. I seriously doubt we will ever get the chance to witness a racer and a sheer competitor of his caliber again. Lewis Hamilton, one of the most talented yet at times temperamental drivers has joined Mercedes F1 Team as Schumi’s replacement and has massive shoes to fill. Keeping in mind this season, the X factor will be whether Mercedes and Lewis Hamilton are in a position to compete with the likes of Red Bull, Ferrari and Mclaren. Mercedes’ success in 2013 depends on a few key factors. Mercedes re-entered F1 as a constructor in 2010, after a gap of almost two decades and lured Schumacher out of retirement to launch a serious bid for the championship. The prospect of winning an eighth World Championship with a German manufacturer added some sort of hope and optimism to Schumacher and Mercedes’ comeback in F1. Having been his long term buddy and previous Technical Director at Benetton and Ferrari, Ross Brawn added to the heightened interest in the Brackley based team. The last three seasons with Schumacher and Rosberg as the driver’s line up, have produced rather dismal results. Additionally there is poor reliability, lack of speed, adaptability and Pirelli tyres being major impediments. Schumacher’s comeback at the age over 40, with Mercedes was always going to be a tricky one. This is because of the rule changes introduced in F1, and primarily because Mercedes had been out of the sport for too long. It takes time to build a highly successful team in Formula 1. However, both Schumacher and Mercedes were hopeful in making it happen. Ferrari had not won a Drivers Championship since 1979 and was struggling when Schumacher decided to join them on a highly lucrative contract. It took Ferrari around three years to start competing with the front runners at the time, i.e. Williams and Mclaren. With Schumacher leading from the front and rallying the whole team behind him, 2000 onward witnessed a level of success that had never been seen in F1. This can be comparable with the biggest sports legacies of all time. The same did not happen to Mercedes. It was only in 2012 that the team showed signs of competitiveness and that too because of getting hold of the required Technical team and resources to continuously design and develop a winning car. The car showed signs of brilliance during the early part of the season, where in China both the drivers qualified on the front row. Nico won. Schumi suffered a mechanical failure while running for second place. The other highlight was Schumacher’s brilliant qualifying lap to steal Pole Position for the Monaco Grand Prix; however he couldn’t start from the front due to a grid penalty from an accident in the previous race. As Schumacher recently highlighted in a couple of interviews, Mercedes did not initially invest as much funds in the design and development of the car as was required and it took them almost two years to hire a competitive Technical Team and design unit. However, Michael remains optimistic of Mercedes’ success in the upcoming season. He believes that all the hard work put in over the last couple of years is likely to pay dividends this year onward. Norbert Haug – long serving Head of Mercedes Motorsport – also retired last year while accepting failure for the team’s lack of success. I do believe Mercedes has a fair chance of competing for podiums at some races this season, however, for them to challenge Sebastien Vettel the youngest Triple World Champion would be a monumental task. Ferrari’s Alonso is also a tough contender. Hamilton’s move to Mercedes is considered by critics as a risky proposition. It might pay dividends for him as Mercedes will be one of the only three engine suppliers next year. Another reason why Mercedes will have a better chance at moving forward is because of the significant rule changes that are being introduced in F1, including the induction of V6 engines on which the company is already working. Hamilton possesses incredible driving skills and if he can manage his temperament and rally the team behind himself, he has a good platform to make a solid impression in future. Vettel’s incredible driving ability coupled with the genius of the Red Bull team is likely to net them a fourth successive F1 title! 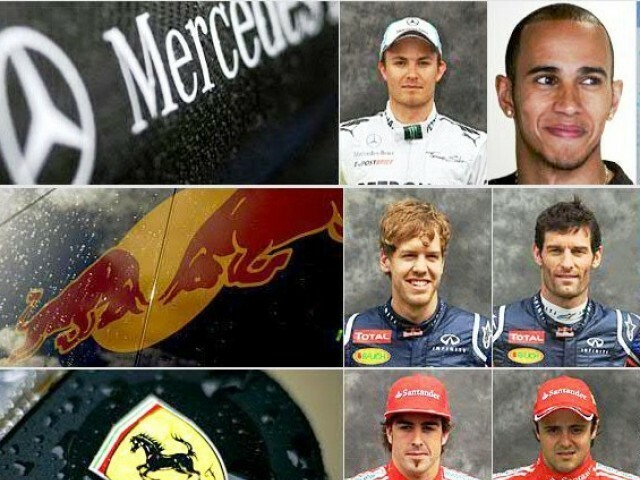 Formula 1: Who will win the battle of supremacy in 2013? No doubt, last years season was one of the most exciting seasons in the recent past, with a new winner in the first seven or eight races. It was though call to who would be nab the construction title and drivers championship till the first half of the season. With Alonso, Vettel, Kimi, Hamilton and Webber all looking quite strong. Red Bull’s sheer pace, Mclaren’s unreliability and bad luck of Ferrari made Red Bull and Vettel come at the top. Last season that i remember that was this exciting was 2007 when Kimi won the championship coming from third in the last grand prix of the season and that to in the later half of the race. It is good to see Formula 1 become exciting again. Blog seems like a copy paste of news and opinion you would find on BBC or Autosport. Mercedes can be competitive next season but it would be extremely difficult to close the gap to the front runners if you consider their poor end to the season, so u r being a bit too optimistic. Vette/Redbull is a safe prediction, Mclaren I believe have little chance, all depends upon Sergio Perez’s performance but without Hamiltion they can’t be a huge threat. Ferrari is the dark horse here, all depends upon their 2013 car.